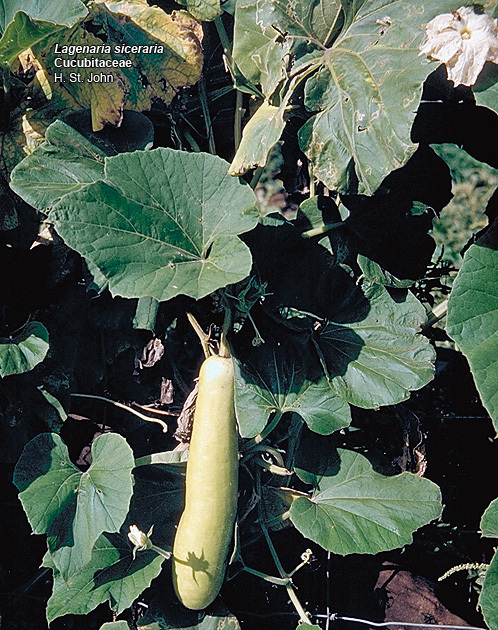 The bottle gourd (Lagenaria siceraria) is probably one of humankind's first domesticated vegetable species, providing food, medicine and a lot more. It probably originated in Africa, from where it got distributed, perhaps by floating in sea to India, China, and as far as New Zealand. The gourd is now widely cultivated throughout the tropics, especially India, Sri Lanka, Indonesia, Malaysia, the Philippines, China, tropical Africa and South America. In Kerala, it is mainly used as a culinary vegetable. The cooked vegetable has cooling, diuretic, sedative and anti­bilious action. 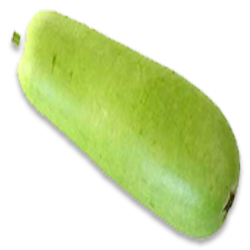 The bottle gourd has been used by many societies in diverse and interesting ways. It probably was first used as a water carrier, but quickly found diverse uses in making pipes, snuff boxes, musical instruments, cricket cages and even life jackets. Containers crafted from the fruit rind of the gourd were in constant use as bottles for carrying wine and water, making the name "bottle gourd" especially appropriate for the crop. A host of musical instruments were also fashioned from bottle gourds, which are in use even today. Gourds are also formed to suit specific uses, by shaping in a mould or tying with string, while growing them. Bottle gourd requires a minimum temperature of 180C during early growth, but optimal temperatures are in the range of 24–270C. The crop can tolerate low temperatures, but extreme cool temperatures will retard growth and frost will kill the plant. The plants are adapted to a wide variety of rainfall conditions. Bottle gourd tolerates a wide range of soil but prefers a well drained sandy loam soil that is rich in organic matter. The optimum soil pH is 6.0–6.7, but plants tolerate alkaline soils up to pH 8.0. High yielding variety released from the Indian Agricultural Research Station, Pusa, New Delhi. Fruits are 1.5-2 feet long and eaten immature. Variety released from the Indian Institute of Horticultural Research, Bangalore with vigorous vines, and dark green foliage. Fruits are medium long and straight, with light green shining skin when tender. Tolerant to blossom end rot. Crop duration is 120 days. Average yield is 40-45 t/ha. Approximately 3-4 kg of seeds are required for cultivating one hectare of land. January-March and September-December are the ideal seasons for growing bottle gourd. For the rain fed crop, sowing can be started after the receipt of first few showers during May-June. Prepare the soil to a fine tilth by ploughing and harrowing. Pits of 60 cm diameter and 30-45 cm depth are taken at a spacing of 3m x 3m for growing on pandals. Well rotten FYM and fertilizers are mixed with topsoil in the pit. Sow four or five seeds per pit at 1-2 cm depth. Avoid deeper sowing as it delays germination. Soaking the seeds overnight in water and giving a pre-sowing irrigation 3-4 days before sowing are found to be beneficial. Seed treatment with 0.2 % bavistin helps protect against the attack of soil born fungus. After sowing, irrigate daily with a rose can. The seeds germinate in about 4-5 days. Unhealthy plants are removed after two weeks and only three plants are retained per pit. In high range zones of Kerala, seedlings can be raised in greenhouses to ensure good germination and are later transplanted to the main-field at spacings simi­lar to those used for the direct seeding method. Apply FYM @ 20-25 t/ha as basal dose along with half dose of N (35 kg) and full dose of P2O5 (25 kg) and K2O (25 kg/ha). The remaining dose of N (35 kg) can be applied in two equal split doses at fortnightly interval. A fertilizer dose of 70:25:25 kg N:P2O5:K2O / ha in several splits . The fertilizer dose per pit would be 28:10:10 g N:P2O5:K2O. During the initial stages of growth, irrigate at 3-4 days interval, and alternate days during flowering and fruiting. Furrow irrigation is the ideal method of irrigating. During rainy season, drainage is essential for plant survival and growth. Bottle gourd can be trailed either on pandals or on the ground; pandals being the most common trailing system used in Kerala. For this, pandals of 1.5 m height are erected using bamboo poles, wooden stakes, GI pipes or other sturdy materials, when the plants start vining. Steel wires/strings, preferably coated with rust proof materials like plastic are used to connect the stakes, and to which coir or plastic ropes are tied in a crisscross manner so that horizontal coir/plastic ropes run across on the top forming a net. Vines are supported by bamboo stakes, which help vines freely climb and reach the top. Alternatively, bottle gourd can also be trailed on the ground without erecting any pandal by spreading dried twigs on the ground. To improve yield, remove lateral branches until the runner reaches the top of the trellis. Leave 4-6 laterals and cut the tip of the main runner to induce early cropping. Removal of lat­eral branches in the first 10 nodes has a positive effect on total yield. Without pruning, most of the female flowers occur between the 10th and 40th nodes, or at a height of 0.5-2.0 m.
Bottle gourd is a cross pollinated crop. Insects, especially bees, pollinate flowers. Pollination can be a problem dur­ing the wet season since bees are less active dur­ing overcast conditions. Intro­duction of beehives ensure good pollination and avoid the need for hand pollination. Spraying vines with flowering hormones at six to eight leaf stage increase the number of female flowers and can double the num­ber of fruits. For example, one application of gibberellic acid at 25-100 ppm increases female flow­ers by 50 % and can work for up to 80 days. Application of ethrel (an ethylene releasing compound) has been found to increase femaleness in bottle gourd. Conduct weeding and raking of the soil at the time of fertilizer application. Earthing up is done during rainy season. Hand or hoe weeding can be performed as needed. Mulching is commonly used for bottle gourd crops grown on raised beds. Use organic or plastic mulch depending on availability. Mulch can be laid down before or after trans­planting and after sowing. Fruit fly maggots feed on the internal tissues of the fruit causing premature fruit drop and also yellowing and rotting of the affected fruits. This fly is difficult to control because its maggots feed inside the fruits, protected from direct contact with insecticides. Control: Apply carbaryl 10 % DP in pits before sowing of seeds to destroy the pupae. Breaking of soil to expose pupae, and burning the soil in pit by dried leaves are also effective. Bury any infested fruits to prevent the build up of fruit fly population. Covering the fruits in polythene/paper covers helps to prevent flies from laying eggs inside the fruits. It can also be effectively controlled by the use of banana fruit traps prepared. The yellowish coloured grubs and adults of the beetle feed voraciously on leaves and tender plant parts, and the leaves are completely skeletonized leaving only a network of veins. When in large number, the pest causes serious defoliation and reduces yield. Control: Remove and destroy egg masses, grubs and adults occurring on leaves. Spray carbaryl 0.2 %. Adult beetles eat the leaves, makes hole on foliage and causes damage on roots and leaves. Grubs cause damage by feeding on root. It also feeds on flowers and bores into developing fruits that touch the soil. Control: Incorporate carbaryl 10% DP in pits before sowing the seeds to destroy grubs and pupae..
Control: Apply 1.5% fish oil soap. First dissolve soap in hot water and then make up the volume. Alternatively apply dimethoate 0.05%. Cottony white mycelial growth is seen on the leaf surface. Chlorotic specks can be seen on the upper surface of the leaves. It is severe during rainy season. Control: Complete removal and destruction of the affected leaves. Spraying 10 % solution of neem or kiriyath preparation. If the disease incidence is severe spraying mancozeb 0.2% will be useful. The disease appears as small, round, whitish spots on leaves and stems. The spots enlarge and coalesce rapidly and white powdery mass appears on the upper leaf surface. Heavily infected leaves become yellow, and later become dry and brown. Extensive premature defoliation of the older leaves resulting in yield reduction. High humidity and heavy dew increase the severity of the disease. Control: Control the disease by spraying Dinocap 0.05%. Mosaic disease is characterized by vein clearing and chlorosis of leaves. The yellow network of veins is very conspicuous and veins and veinlets are thickened. Plants infected in the early stages remain stunted and yield gets severely reduced. White fly (Bemisia tabaci) is the natural vector of this virus. Control: Control the vectors by spraying dimethoate 0.05%. Uprooting and destruction of affected plants and collateral hosts should be done. Harvesting can be done only after 10 days (at least) of insecticide/fungicide application. The fruits should be washed thoroughly in water before cooking. Bottle gourds are permitted to obtain a maximum maturity on the vine before harvest. Harvest gourds when vines are dry. Fruits that are not fully mature or that have been injured do not store well. The fruits are ready for harvest 60-120 days after sowing depending on the variety. Cut the fruits from the vines carefully, using pruning shears or a sharp knife leaving 3-4 inches of stem attached. Snapping the stems from the vines results in fruits without stem attached, which reduce the storage life. When harvested with a short length of vine, they can be hung from wires below a hot ceiling, where they slowly dry out. Depending on vari­ety and crop management, the crop yield can vary between 10-20 t/ha.